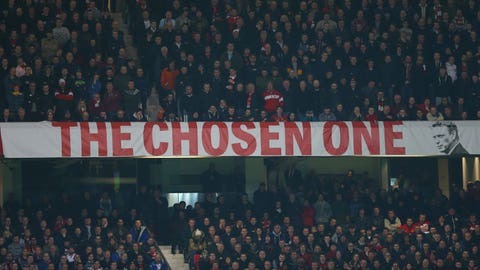 Manchester United stewards have been deployed to guard 'The Chosen One banner' at Old Trafford. David Moyes will face the press today amid reports of a protest calling for him to leave Manchester United. 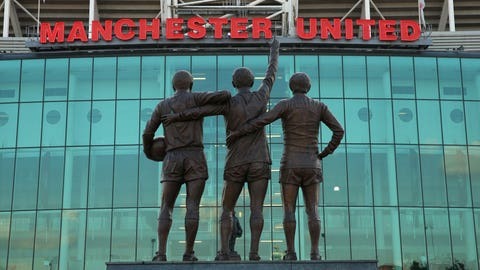 According to widespread stories in Friday’s national newspapers, a group of United supporters has paid for a plane to fly over Old Trafford on Saturday trailing an anti-Moyes message. The message will reportedly read ‘Wrong One: Moyes Out’ in answer to ‘The Chosen One’ banner which continues to fly inside the stadium despite heavy home defeats to rivals Liverpool and Manchester City in the past month. Stewards have recently been deployed to guard the banner, which references the fact Moyes was hand-picked for the job by Sir Alex Ferguson. United are already guaranteed their lowest Premier League points total and host Aston Villa on Saturday in seventh place, 18 points behind leaders Chelsea less than a year after winning the title. Moyes can expect more criticism if Villa leave with anything, but the visitors’ manager Paul Lambert has called the planned plane stunt "extreme". He said: "I think some of the criticism is way over the top, I really do. If you are talking about flying an aeroplane over the stadium with a message to say you are not wanted, it is a bit extreme. "I think the magnitude of the job is huge. Only David can truly tell you about that, but from the outside looking in, it is a massive, massive job. "It is not as if he is standing out there and thinking ‘things are not going well, but I still feel good’. He is human like everybody else and when you get that level of criticism it would not be nice." Moyes’ pre-match press conference is scheduled for 1.30pm this afternoon, when he is expected to face questions about the protest and United’s poor form.